Expresso® now handles GDPR Personal Data Assessments! 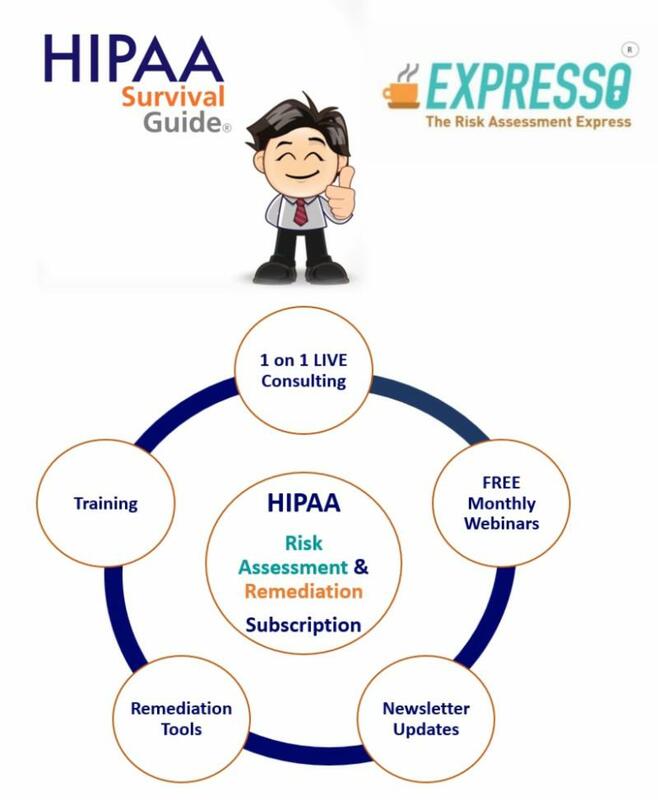 HIPAA Survival Guide Subscription customers may purchase GDPR with Expresso as an ADD-ON for a one-time cost of $495.95 with no increase to your renewal fees. Click here for more information and to purchase GDPR with Expresso ADD-ON. Non-subscription clients may purchase Expresso with GDPR Subscription that includes GDPR Products for $1,295.95. Click here for more information and to purchase Expresso with GDPR Subscription. Expresso® was designed to manage more than one compliance regime. We are now delivering on that promise. Our competitors' products were narrowly focused on HIPAA and they have no easy path to migrate their offerings to other regimes. This includes smaller competitors and those that come with a more hefty price tag. None are delivering the kind of innovation that Expresso® represents. We have rationalized the GDPR risk assessment in a more streamlined manner because GDPR is even less prescriptive than HIPAA. Our decade of experience provides you with a foundational list of 10 Essential Controls that any compliance regime requires. 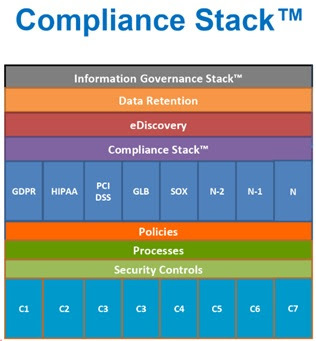 We introduced the Compliance Stack™ as a way to explain this groundbreaking innovation to the marketplace. 1. Risk Management: This Control encompasses the entirety of an entities Risk Management program ("Program"), including Risk Assessments and implementing additional Security Controls ("Controls") that reduce Risks to levels that are "reasonable and appropriate." 5. Authentication: The ubiquitous nature of smart phones has led to widespread use of two-factor authentication by most large organizations including banks, brokerages, and of course all the major technology firms. 7. Disaster Recovery: Disaster Recovery is yet another meta-control because it encompasses much more that data backups. Of course, backing up your protected data, and all your data for that matter, is mission critical. GDPR products can be purchased as a subscription or individually (including the Combo Package). Your GDPR NOPP is similar to covered entities NOPP under HIPAA, except you need to provide access to it in places where Data Subjects would expect to see it. Surprisingly there is only one Article in the GDPR (Article 32) that deals directly with security. It's not that security is not important under the GDPR, it obviously is; rather, it's that the emphasis on Privacy dominates. The GDPR introduces Breach Notification into the EU for the first time. Given what we have witnessed under HIPAA (post the HITECH Act) Breach Notification will also emerge as the GDPR's 800-pound Gorilla. If you have any additional questions regarding GDPR Compliance, please contact us via email at support@3lionspublishing.com or by telephone at 800-516-7913. What are the Application Security Considerations for Healthcare? "Why does health care seem to be disproportionately the target of ransomware attacks, and what can be done about it? To understand why somebody would attack healthcare organizations using ransomware as their strategy, you have to know what the motivation of the attacker is," wrote Tim Jarrett, Senior Director, Enterprise Security Strategy in an article in Health Leaders Media, Senior Director, Enterprise Security Strategy. In addition, on April 14th, Becker's Healthcare IT and CIO Review reported: "There were 1,519,521 breached patient records in March, representing a 155 percent increase in the number of breached records in January (388,307) and February (206,151) combined." Healthcare information has been featured in the news of late for data breaches, ransomware, and phishing schemes. If you don't have a plan in place to deter these actions, I recommend taking a look at the HIPAA Survival Guide's Risk Assessment and Mitigation products. They are offering a FREE test drive of their signature Risk Assessment product, Expresso™. Get a FREE 15-day Expresso™ Test Drive. Expresso™ is an easy to use Risk Assessment software that allows you to detect risks, threats, security objects, and vulnerabilities to Protected Health Information and identify impacts and assign controls at a glance! Just click on the Act Now Button below and fill out the information and the HIPAA Survival Guide's customer service staff will set up your Free 15-Day Expresso™ Test Drive. They will also arrange a "Go To Meeting" session to provide an introduction to the software and review how you can do your HIPAA Risk Assessment in 3 hours or less. Every team member is an essential part of the team and brings unique qualities and experiences to bear in their assigned role. This is an axiom of team dynamics; however, it is a pure abstraction and is only relevant if each team member is made to feel unique. One of the Natural Leader’s primary goals is to develop this sense of uniqueness through quiet praise and various other subtle techniques, assuming, for the sake of argument, that the respective team member is indeed making unique contributions. Effective multidisciplinary teams are mission critical if population health initiatives are to succeed. Further, it is questionable (i.e. highly unlikely) that “pure clinicians” have the breadth and depth of clinical and technology experience to recruit, build, nurture and reward a team consisting of the right players. One not so subtle technique for rewarding high-performing individuals is to create forums wherein team members get to shine in front of their peers. I have used this method with great success and go out of my way to look for opportunities that fit a particular individual. This is often most beneficial for journeyman and junior team members, who otherwise might not get a chance to lead the congregation. Can I get a witness? There is something about sharing a meal together, in a social context outside of the work environment, which contributes more to team building than a thousand and one classes in sensitivity training. We are social animals and breaking bread together is probably the most socially rich experience that we partake in. Consider the fact that this is something usually done with family members, dear friends, and close acquaintances (i.e. except when contrived for business purposes or formal occasions) and you can begin to appreciate why it tends to have such a salutary effect. If you want to build a lasting bond between team members, then learn to do little things from the heart, often. It always seems to be the little things that someone does that makes them stand out in our hearts and minds. Perhaps it is the only way that human beings actually demonstrate their humanity. Kindness cannot be faked. It must be genuine and heartfelt, or it ceases to be. Kindness inspires trust. It is probably a natural law that one cannot demonstrate kindness to another human being without wishing them well. It should not be surprising that we tend to respond favorably to random acts of kindness. Because population health initiatives require such specialized and individualized skillsets we are simply forced to “trust but verify” that individuals are producing the requisite critical path deliverable at the appropriate time. Trust help team members come forward when they otherwise might hold back for fear of criticism or worse. There is clearly an accepted (and often expected) high-performance team sub-culture that has emerged over the last 20 years. Some of the key elements of this culture are hard work, creativity, and fun. Successful and innovative organizations such as Apple, Google, and Facebook work diligently at culture creation and building team identities. This effort ranges from creating T-shirts with team names and logos to providing code names for all projects. Why? Because these companies realize that having the appropriate culture contributes significantly to their bottom lines. It immensely improves their recruiting efforts and dramatically reduces employee turnover. It also creates an environment where creativity and productivity flourish. Men and Women have an innate need to belong, to be part of something that is larger than self; this is an irrefutable historical fact. Whether the larger group is based on race, religion, political ideology, nationality, or the gang from the barrio, the specific manifestation often seems to make very little difference. The need is a powerful one and demands to be satisfied. A relatively small team or a number of small teams working in concert, each possessing a strong identity, often conspire to bring great products to fruition. The ability to create a strong team identity is critical to the mission’s success. It is something that the Natural Leader must establish early in the mission’s planning process and continue to strengthen during its execution. Population health initiatives are by definition transformative. A “run of the mill” project team will never achieve the mission. Whose team is this anyway? High-performance teams, jelled teams, killer teams or in short, great teams, require a considerable amount of energy to build and sustain. However, their complete and utter destruction can happen in a matter of hours or less. This happens most often when outside forces, not understanding the team’s dynamics, impose constraints or demands that make the contracts that took so long to negotiate, unenforceable. The quickest way to ensure the team’s destruction is to change the Natural Leader, either voluntarily or involuntarily, without any preparation or consideration for who will assume this role. Organizations must learn to have a better ear for team dynamics. In many ways the Natural Leader embodies the team. He or she created it, nourished it, and maintained and enforced the contracts. They often command more loyalty from the troops than some arbitrary organizational hierarchy that won’t hesitate to downsize them out of existence at the first sign of trouble. Given the complexity of population health initiatives, you can be sure that the team will experience more than its fair share of challenges—that’s simply the nature of the beast. Interfere with the dynamics of a successful team (i.e. the one working on the transformation of your business model) and you may have just shot your organization in the head. Team implosions in complex projects are legendary. One minute the magic is so palpable that you can breathe it like pure oxygen, the next minute the fire you started consumes it, and you are left choking to death. Now you see it, and now you don’t. I will pay more for the ability to deal with people than for any ability under the sun. Almost everything non-trivial that happens in the business world, and in many other walks of life, is the result of a project. Projects have a well-defined beginning, middle and end. They always require a project plan. The plan not only defines the stages of the project but also drives its execution. I prefer the word mission because it implies motion and carries a greater sense of urgency. Given the importance of population health initiatives to their respective stakeholders, I can assure you that there better be a sense of urgency, or this initiative will wither and die on the vine. You usually either sign up for the mission through pressure from your current employer or preferably, you volunteer on your own. However, signing up for a population health initiative is, for me, a much deeper commitment than is apparent on the surface. It means that you will do almost anything within your power to achieve the end game. It may make the difference between your organization thriving and prospering in the rough and tumble world of 21st-century healthcare, or becoming roadkill on the information highway. For population health initiatives, signing up does not necessarily imply consistently working 60 hours a week for the duration of the mission. However, it does imply that you will go above and beyond the call of duty, which often entails some overtime, and/or other personal sacrifices at critical junctures. Signing up is a binary proposition, you’re either on board or you’re not. There is no acceptable middle ground. It is a contract with the rest of the team members. It is mutually binding and cannot be broken without putting the mission at risk. Getting all team members signed up is the responsibility of the mission’s Natural Leader. On projects where I have assumed this role, I always look for opportunities to shoot on sight any team members caught sitting on the fence. They usually die a very slow and painful death, often from multiple wounds. I would rather reduce headcount than risk the mission by having to carry wounded combatants iteration through iteration. This is hyperbole of course but you get the drift. While Signing Up ensures that everyone on the project commits to everyone else by signing the same mutually binding contract, the Natural Leader also signs a personalized contract with each individual. This contract is a promise that individual, and specific, benefits will accrue to each (and every) team member in return for his or her effort during the mission. It answers the question “What’s in it for me?” This contract is implicit between the Natural Leader and an individual team member and is not shared with other mission comrades. Would you persuade, speak of interest not of reason. In Black Hawk Down the movie’s powerful punch was delivered not by outstanding performances from Hollywood’s elite, but by the graphic representation of the brutality of war, and the poignant relationships that are manifested in the middle of life and death situations. The motto of Delta Force is, “No One Gets Left Behind,” and I guarantee you, if the film is to be taken at face value, this is no gung-ho marketing campaign. It is a mutually binding contract that is honored at all costs. Notice that all this contract talk does not involve an organizational abstraction outside of the project team. It is widely known that soldiers in the heat of battle fight harder, and often until no one is left standing, not for God or country, but because of the personal relationships they have with those in nearby fox holes. It is the shared experience of the mission that brings out the best in us. Natural Leaders own the mission. By definition, there is only one Natural Leader for any given mission. They can coexist with a leader that derives authority from position power but are obviously more effective when position power and natural leadership are aligned. Natural Leaders create team magic. Magic is not a by-product of serendipity. It is clear that renowned movie directors do not rely on serendipity to create the cast chemistry required for a great movie. The creation of cast chemistry is premeditated. Good fellows are a dime a dozen, but an aggressive leader is priceless. How do Natural Leaders do what they do? Does it require charm, superior social skills, above average intelligence, empathy, and love of humanity? Well, the truth is that no one knows for sure. Probably a Natural Leader possesses all the aforementioned qualities and still others that remain unnamed. The nature versus nurture argument is relevant, and like so many other cases where this argument is raised, the only plausible answer is that natural leadership requires some combination of both. That said, it is clear that leadership skills can be improved with practice and grow with experience. It must be noted that leadership skills are not immutable. Change the mission context in a dramatic fashion and/or within a different domain and you are unlikely to see the same Natural Leaders emerge. Leadership is often fleeting. It is extremely context sensitive and occurs within certain space and time boundaries. That said, within a given context and domain, leadership can certainly be maintained across a relatively large number of missions. As previously mentioned, there are no scientific principles of leadership, and perhaps there never will be; yet there are some rules of thumb that have worked for me and I will share them with you in subsequent posts. These always seem to apply, despite the composition of the current team and the context of the current mission. Everything you may know about Population Health (PH) is wrong. I wrote about the complexities associated with PH in the ACO Survival Guide (the Guide). The Guide describes the moving parts necessary to succeed using the accountable care model including data analytics, care coordination, quality metrics and, of course, a deep understanding of HHS' evolving reimbursement regulations. Certainly, any knowledgeable observer could review the Guide and conclude that the ACO model was fraught with complexity and there were plenty of opportunities for false starts and outright failures, potentially costing an organization tens of millions of dollars. In my new book (yet untitled) I will explore the individual points of failure that will lead to many organizations experiencing failed ACO implementations. Here's my thesis in a nutshell: Effective Patient Engagement is ALL that Matters. Although the thesis may seem obvious to knowledgeable observers, more ambiguous are the kinds of impediments and outright roadblocks that vendors put in the way of achieving this mission, combined with a specific kind of talent deficit in provider organizations that will collectively lead to less than optimal results (understatement). Now, this is not simply evil vendors looking to make a quick buck (although many obviously are) but rather that the vendors seek to impose their innovation agenda on providers and most providers are not knowledgeable enough to understand that the vendor's agenda probably (almost certainly) does not align with their own. Healthcare providers are not savvy consumers of information technology. In fact, quite the opposite is true. Must providers have been laggards in adopting information technology. We need look no further than the fact that it took the HITECH Act (under its meaningful use provisions) to push providers into adopting electronic health records en masse. In short, even if the vendors and provider's agendas were aligned, the healthcare industry is not poised to innovate anywhere near the pace that vendors are attempting to push it. This cognitive dissonance will cause billions of dollars to go up in smoke industry-wide as population health initiatives are foisted on the marketplace not by the government, but by competitive pressures that have now been unleashed. Not only are providers experiencing a talent deficit of a significant magnitude, but vendors themselves struggle to attract and retain the talent necessary to succeed on their own agendas, let alone delivering enough talent to support their customer’s success as well. Why is that? Part of the answer is that the healthcare industry is enormously complex; therefore, attracting talent with both information technology skills and healthcare subject matter expertise is daunting. For those of you in the middle of PH initiatives, just review how often project managers have to be swapped, clinical consultants have to be replaced, and projects are delayed due to lack of technical expertise related to one of perhaps dozens of applications that need to be modified in order for the initiative to succeed. Lastly, technology projects, for example data warehousing/business intelligence projects, often fail (across industries) not because of algorithmic complexity but rather as a result of two principal factors: (1) data complexity (i.e. semantic challenges upholding a single source of truth); and (2) the multiplicity of interfaces between applications requiring integration. In healthcare, these two factors are critical for supporting effective patient care. So why are the blind leading the blind? Because neither vendors nor providers collectively share the same vision or agenda that powers the end game – Effective Patient Engagement. Interested in a Masters degree in Health Informatics? 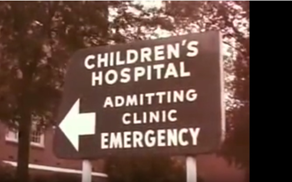 I was asked to participate in a video (above) about the University of South Florida Morsani College of Medicine's graduate program for Health Informatics. Because it is an online program, there were students from across the country as well as Florida. I was able to finish the program in a little over a year. If you're interested in learning more about Health Informatics check out the curriculum on the USF website. Daniel's presentation is fascinating - there are a significant number of new technology applications on the market, some still in clinical trials. However, he shows us the potential changes that can come from their use in medicine with real examples, including those for Telemedicine.